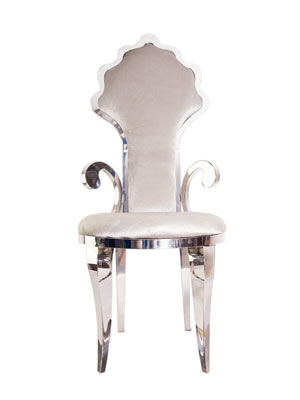 Velvet Padded Silver Chair are extremely luxurious and you feel like a king or queen when you sit on our velvet padded silver chairs. Our Velvet Padded Silver Chair have looked like trendy, contemporary, playful, efficient, glossy, stylish, well-built and superbly easy, our variety of Chairs without Arms offer an ideal solution for Function, Wedding, Party, Event, exhibition, restaurant and home. These chairs are made from Top quality Polypropylene plastics and are specifically designed to take less floor space with high level of calm. Build to excellence, our range of chairs is available in Gold, Silver, Black and Silver Finish. From examine and make to marketing, we bypass our products through frequent, stringent filters to make sure that only the top products reach you. All clients know about the quality, designs and other impactful features.